My name is Noah Hornberger. I'm a former Pixar artist (Wall-E, 2008) and Professor of Animation (DePaul University, Chicago), and I have recently invented a motion-activated musical toy called the Dub Cadet. One Substance TV blogger has called my light-up sphere that transforms motion into music, "Daft Punk [the electronic music duo] meets Simon [the handheld toy] in a ball." Dub Cadet sending MIDI data to a Roland voice bank! After a brisk year of prototyping and tinkering, I've created this simple but revolutionary new toy. With buttons labeled arpeggio, loop, and drumbot, the device measures 6 inches in diameter and contains a speaker and electronic musical brain to create generative, improvised music. 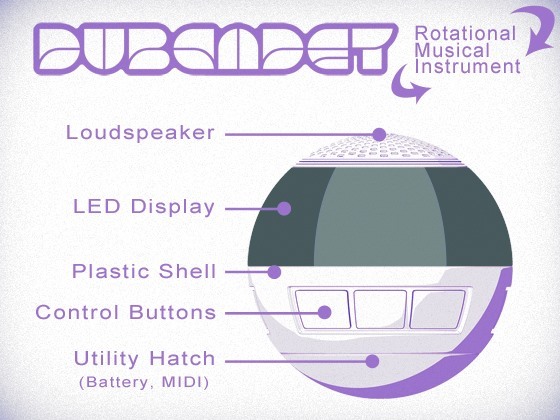 By utilizing the same gyroscopic sensors used in smartphones, pedometers and the infamous Segway, the Dub Cadet's internal circuitry tracks 3D motions and turns them into harmonious chords and rhythms, offering the experience of musical creation to anyone who can turn the ball. The Dub Cadet is a cross between a toy and an instrument that allows people to discover musical composition right in the moment, without study or practice. I envision a new line of gestural music products that are as simple as the iPod but actually allow you to create your own music on-the-fly. I see an opportunity for the new motion sensing technologies to be fine-tuned for musical purposes. It's an unexpected career change, but I'm taking the leap. The precise rotation and speed of the Dub Cadet determines what pitches play from this MIDI and Arduino-based electronic instrument. It can produce over 3 million possible rhythm possibilities for any one bar of music. By offering intuitive controls, the user can generate an endless variety of musical patterns for hours of creative brainstorming, music education, and fun. Currently, I'm raising funds via Kickstarter to turn the working prototype into a final product set to be shipped in October 2012. Take a look inside. A more detailed how-to is coming shortly... so you may be able to make your own at home, if you've got the time and resources. For a video demo, a detailed list of features, and to pre-order the Dub Cadet, visit the Dub Cadet Kickstarter Page! A $118 pledge to the kickstarter will allow me to build one just for you and ship it to your door! Consider joining forces to make this dream a reality! Nice use of arcade buttons! "if you build it they will come", well he built it !!!! so now you can go to kickstarter and get yourself one, before they are twice the price at Target!